Staples Self-Inking Stamp $0.99 Shipped! Visit Staples.com to get started. Click “Order Now” in the red box with the stamp pictured. Design your stamp as you wish. Click “advanced editing” to upload a picture to your design. (you can choose to include it in your design or slide your image outside the visible area to ‘hide’ it. If you hide it you’ll get a notification when you go to order that your image is not withing the margins, just select “continue without changes” to proceed). Approve your design and click “Next” to checkout. 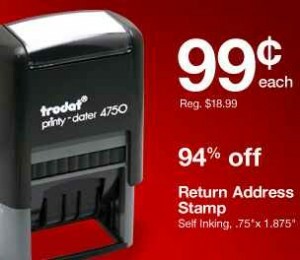 Enjoy your Self-Inking Stamp at this great deal! And I needed a new one!!! Thank you, super easy to do. Ok, what am I doing wrong? I uploaded a picture and everything. It said $9.95 for shipping…. help? Aww! I was wanting the stamp! But 9.95 ship is too much! Am I missing something? A code? they were $0.99 yesterday but are now $9.99. The shipping is free ONLY if you upload your own photo…I put one in my cart with my own uploaded photo yesterday & it said shipping was free. but since I didn’t order it yesterday, the price has now went up. Don’t worry if you missed it. Staples apparently caught their mistake and even you ordered while it was working, you’re not going to get that price after all. I got an email from Staples this morning saying that they forgot to charge shipping and it will cost another $9.95 more than the confirmation said it would be. If you did this deal, make sure you check your email! Thank you for your recent purchase of a custom stamp (3/4” x 1 7/8′), model E4912, sku 341978. Please note that the advertisement for this stamp stated that “Shipping charges apply.” We have identified that your order (order number listed above) is missing the required shipping fees. If you would like 7 day delivery, the shipping charge is $9.95, or you can choose expedited shipping for $13.95. Please call us at 888-333-3199 by Tuesday, January 29th to confirm your desired shipping preference. If we do not hear from you by this date, we will assume that you do not want the order fulfilled and we will issue you a refund within 5-7 business days. FYI, I did upload an image and push it to the side.